Do you buy "Not for Sale" / Examination books? Yes, we gladly accept books marked "Not for Sale." This includes Advance Reading Copies, Uncorrected Proofs, and Unbound Galleys. These books are worth 50% of the standard price. 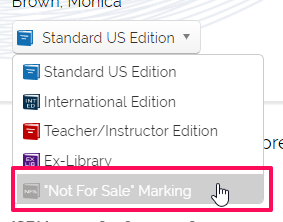 To quote one of these items, you must choose the '"Not For Sale Marking" option from the edition drop-down.